"Mistrust, Mayhem, And Scandal Rocks Chestnut Field." Laurie is distraught when she makes a startling discovery about her long-lost friend, her beloved chateau, and when she learns the sobering truth about, Avery Gallagher. She meets Avery’s brother, Jessie Vladimir and suspects that there is more to him than he reveals. Justin, on the other hand,remains a mystery and Laurie has yet to meet him. As Laurie continues on her ghost-hunting quest, unbeknownst to her, potent forces close in on her identity, and are determined to uncover her origins. "A secret thriller, with a paranormal twist...perfect read for suspense lovers." Suspenseful-Mystery, Fiction Novel. Reclamation: Book Three of the Ceiba Pentandra Series © A soon to be best seller series. After i finished the third book I appreciated fully the size of the writer`s intelligence. 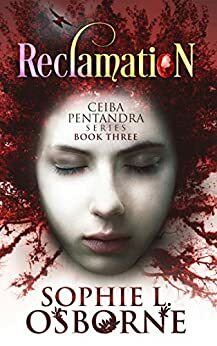 Never have I enjoyed picking up a book as I have over the last few weeks as I ingested Reclamation: Book Three. The test of a good book or movie is that long after you have seen or read it you cannot forget about it. It leaves an impression on you that will remain with you throughout your life & I believe for me the author succeeded in that as far as I am concerned. 5.0 out of 5 starsGreat series! Such a fun read. Great loved every moment. 5.0 out of 5 starsAmazing series!! Awesome book series!! My 13yr old daughter and I couldn’t put them down! !